Legislator Nowick extended her gratitude for a successful summer concert series. Smithtown, NY - September 4, 2013 - As Suffolk County Legislator Lynne C. Nowick is term limited and cannot run again for the Suffolk County Legislature, she offered a heartfelt thank you to everyone involved in organizing, producing, staging and promoting the annual Dennis Cannataro Summer Family Concert Series on the lawn of the Smithtown Library. The concert series has been renamed after Legislator Nowick’s brother who passed away in 2011. “Nine years ago, Dennis suggested the concerts and in partnering with Dave Berner of the Smithtown Library District and the Friends of the Smithtown Library they were able to turn his vision into a reality. Dennis took great pride in making this an extraordinary community event,” stated Legislator Nowick. 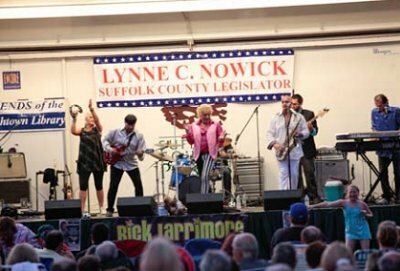 Subject: LongIsland.com - Your Name sent you Article details of "Suffolk County Legislator Lynne C. Nowick Thanks Everyone for making the Summer Concert Series a Success"